Adolescent age is considered as a transitional phase, a “status passage” between childhood and adulthood (Fend, 2000; Flammer and Alsaker, 2002; Hurrelmann, Rosewitz and Wolf, 1994; Maggs, Schulenberg and Hurrelmann, 1997). In this transition phase, bodily, emotional, and social changes occur and these changes fully occupy the attention of the adolescents. The main questions that are stated to the self are concentrated on emotions (“How am I?”), social development (“What am I able to do?”), and identity (“Who am I?”). The adolescent way of thinking is rather egocentric (Elkind, 1978) and adolescents are quite concerned about their appearance, their impression on others, and their abilities. Also, they tend to feel to be the focus of attention of others. Development of Self is an important phase of adolescence stage. Self is very complicated. It is composed of, according to some Psychologists, many psychological states like feelings, attitudes, impressions, habits dispositions, likes and dislikes. It refers to the image which adolescents hold about themselves. Among the attitudes, these are those things which are most concerned about them. Attitudes of right and wrong may also become part of their psychological self. Self may involve, after certain stages of psychological growth, concepts like I, we, mine and yours. About self, questions like worth, right, wrong and justice, etc., may become predominant. The growing adolescent’s ability and the concept of self, is influenced by the way in which they accept others. Closely associated with the problem of self is the quest for meaning and purpose which constantly keep adolescents thinking. This is so because they are constantly in search of selfhood. A Self-concept is a person’s total view of him or herself (Hamachek, 1987). Self-concepts are not static and unchanging (Hamachek, 1987). The “I” refers to the subjective self who organizes and interprets experience. Understanding one’s “I” is based on several dimensions: continuity, distinctiveness, volition, and self-reflectivity. Roger’s views on self-concept grew out of his extensive work in counseling psychology (1942, 1951, and 1965) From Rogers’s perspective, four of the most important characteristics of the self are that the persons strive for a consistent self-concept. Behaviour is consistent with self-concept, experiences that are inconsistent with the self-concept are viewed as threatening, and the self-concept changes as a result of learning and maturation. Learning is one of the fundamental areas in psychology. The theorists named already Pavlov, Toleman, Watson, and Skinner are some of the most influential in the entire discipline. The history of learning theory is, in many ways, the history of psychology. Some of the earliest psychological research came from studies in animal learning conducted by Edward L. Thorndike in the 1890’s Edwin R. Gurthrie in the early 1900’s and from Toleman, Pavlov, and others. One of the most important movements in psychology, behaviorism, was largely a learning-based approach. Watson founded this school of thought, described in his book Behaviorism (1925), in an effort to make psychology an objective and scientific field of research. He believed that all behaviour could be explained by learning principles. Skinner extended and continued this field of thought beginning in the 1930’s and behaviorism dominated psychology for most of the next few decades. Indeed, inquiry into learning styles often encompasses study of traditional cognitive styles. Nevertheless, learning style constructs tend to be much more classroom and instruction oriented than traditional cognitive style constructs and usually are studied in and applied to instructional contexts. A great variety of learning styles have been identified. Many are applicable to special education (Dunn, 1983), while others are more appropriately applied to higher education (Gregoric, 1979). Different theorists have taken different theoretical and applied approaches to the study of learning styles. Dunn and Dunn, whose work has been particularly school and classroom oriented (1975, 1977, and 1979), have identified four major categories of learning-style variables: (1) environmental, (2) emotional, (3) sociological, and (4) physical. The Dunn’s environmental category involves learning style elements relating to student’s preferences for learning under different conditions of light, sound, temperature, and design (the last involving preferences for studying under formal or less structured learning conditions). The Dunn’s emotional category concerns student’s motivation, persistence, responsibility, and need for structure. Their sociological category relates to student’s preferences as to learn by themselves or with others. The physical needs category involves modality preferences in learning, which Dunn and Dunn stress heavily, and other physical needs variables they believe are important to learning. On the other side Study Habits is an important aspect in the field of educational psychology and is ultimately related to learning style and academic achievement. Majority of the students face serious problem of how to study and lack of awareness is a hindrance to become good academic performers. It is the absence of proper study habits and techniques that they fail to achieve the maximum within the limited time schedule. Like any other habits, study habits are also acquired through learning. Students get habituated to read and write in certain fixed ways. Most of the educational crisis such as underachievement, absenteeism stagnation, and academic drop out are usually concerned with the improper utilization of the study programs with respect to study time (Raj and Sreethi, 2000). Poor habits of study not only retard school progress but develop frustration destroy initiative and have different level of academic achievement i.e. high and low. They also differ in the pattern of study habits. Some of students have better study habits while the others have poor habits better the study habits better is the academic achievement means how much knowledge the individual has acquired from the school. Academic achievement of the students is determined by their study habits. Study habits and academic achievement are very essential for research worker and educationists to know that every child whether he is gifted, backward etc should be educated in their own way but if they poses good study habits they can show performance in academics and in every situations and if children do not possess good study habits they cannot excel in life. It is the study habit which helps the learner in obtaining meaningful and desirable knowledge. Good study habits act as a strong weapon for the students to excel in life while as Academic achievement is considered as a key criterion to judge one’s total potentialities and capabilities. Therefore it is more pressing for the individuals/ students to have high academic achievement. The term achievement refers to the degree or the level of success attainted in some specific school tasks especially scholastic performance, in this sense academic achievement means the attained ability to perform school tasks, which can be general or specific to a given subject matter. Academic achievement could be defined as self-perception and self-evaluation of one’s objective academic success. Academic achievement generally indicates the learning outcomes of pupil. Achievement of those learning outcomes requires a series of planned and organized experiences. Good (1973), has defined, academic achievement as knowledge attitude or skill developed in the school subject usually designed by test scores or by marks assigned by teacher or by both. Consequently, academic achievement could be defined as self perception and self evaluation of one’s objective success. The world is becoming more and more competitive. Quality of performance has become the key factor for personal progress. Parents desire that their children climb the ladder of performance to as high a level as possible. This desire for a high level of achievement puts a lot of pressure on students, teachers, schools and in general to the education system itself. In fact, it appears as if the whole system of education revolves round the academic achievement of students, though various other outcomes are also expected from the system. Thus a lot of time and effort of the schools are used for helping students to achieve better in their scholastic endeavors. Human beings are the ocean of the capacities and abilities. Having capacities and abilities are not assurance and seal for success. A person gets the concept of his abilities in the society. His concept about his own capacities, abilities and characteristics is known as self-concept. The self-concept plays a vital role and has a vital significance in the existence and life of an individual. If a person understands and realizes himself in a right way, he develops positive self-concept and he turns into a star. If he does not understand himself in a right way, he develops negative self-concept and turns into waste. A student who is abused, insulted beaten etc develops negative self-concept and therefore remains academically backward while as a student who is reinforced positively becomes a high academic achiever. We know that a student’s memory, reasoning, problem solving, thinking, understanding, recall, recognition, perception, attention and memorization etc all are influenced by his self-concept therefore the self-concept (the core part of personality) should be developed in a right way, so that these abilities would achieve maximum heights in academic side. Learning is a highly complex problem in psychology. Different psychologists have tried to explain it in their own ways. When one thinks of various theories of learning, one is aptly reminded of the story of seven blind men who described the elephant according to their individual experiences. One who touched its ear said that the elephant was like a fan, one who touched the back described it as a wall, and one who touched the leg described it as a tree and so on. The teacher knows the importance of practice and insists on its application till a task becomes automatic. He also knows that mechanical practice is of no avail and as such he insists on practice with motivation and interest. To keep the learners motivation high, he uses the necessary incentives in the form of reward and punishment, praise and reproof etc. The teachers also know that efficient learning demands a certain amount of readiness in the pupils. Consequently, he observes the cognitive and emotional readiness of the pupils before he sets up a new learning situation. While learning style assessments reveal distinctions between students and their learning preferences, learning style variables may not account for enough learner variances to make them major springboards for educational intervention. Indeed, it is questionable as to how much learning environments can be adjusted to meet particular student needs. Insight into student’s learning styles may provide useful instructional hints for teachers. Study habits play a very important role in the life of students. Success or failure of each student depends upon his own study habits. Of course, study is an art and as such it requires practice. Some students study more but they fail to achieve more. Others study less but achieve more. Success of each student definitely depends upon Study habits, learning styles, intelligence ability and effort of students. No doubt, regular study habits bring their own rewards in the sense of achievement of success. It is the duty of teachers to develop good study habits among students. Such habits are the best equipments with which they can live and lead their lives with confidence. If the habits are developed in the young age they will definitely cherish the joy of its fruits in the rest of their lives, because grown up children are already habituated to certain things. So they find it difficult to modify their habits and behaviour. Therefore, it is better to develop study habits in secondary school students. It is the proper time and age to cultivate study habits. At this age students are quite mature. They are able to know what is good and what is bad. They can avoid bad things and invite good things with the help of teachers. The efficient and effective way of learning depends upon the study habits of the students. Study habits are important they influence the academic achievement of students. So parents and teachers must help in improving the study habits of students. Teachers in schools should become facilitators of learning. Learning improves with planning of where, when and how much to study. The finite treasure within every learner should be discovered and nurtured for the purpose of improving learning effective study skills have to be taught. Study skills involve reference, reading listening, study habits and strategies. Positive attitude, proper physical condition and balanced emotional states are important factors influencing study habits (Crow and Crow, 1956). Proper study habits in an individual are of most significant importance. It helps an individual to attain mental peace and enables him to interact in an impressive manner. It is quite natural that every individual is a slave of habits whether good or bad but it is witty to have good study habits as they benefit the students. Instead of wasting time and leisure it is better to utilize every second in obtaining and acquiring knowledge and thus include good study habits. Besides the self-concept, learning styles and study habits, there are various other things which an individual aspires for, one such important factor is academic achievement. Academic achievement is a capacity to excel others which is important component for every person especially for a student to be successful, as he is always facing competitive situation in his educational career. Achievement after all is the end product of all educational endeavors. The main concern of all educational efforts is to see that the learners achieves. A teacher is supposed to arrange the educational situation in a way so as to encourage pupils to put their heart and soul in the school activities. The main concern of all educational efforts is to see that the learner achieves. Quality control, quality assurance and of late total quantity quality management of the achievement have increasingly gained the attention of researchers in education. Hence the problem of achievement has drawn sufficient attention of researchers in the field of educational psychology. The researcher has thus decided to compare four major groups of Kashmir having distinct Self-concept, learning styles, study habits and academic achievement. As the study will become the guideline for the researchers, teachers, administrators and counselors to guide the students in the proper way so that they may develop good self-concept, learning styles study habits, and achieve better in the competitive examinations. 1. To assess Self-Concept and Learning Styles of adolescents. 2. To assess Study Habits and Academic Achievement of adolescents. 3. To compare male and female adolescents on Self-Concept and Learning Styles. 4. To compare rural and urban adolescents on Self-Concept and Learning Styles. 5. To compare rural male and rural female adolescents on Self-Concept and Learning Styles. 6. To compare urban male and urban female adolescents on Self-Concept and Learning Styles. 7. To compare rural male and urban male adolescents on Self-Concept and Learning Styles. 8. To compare rural female and urban female adolescents on Self-Concept and Learning Styles. 9. To compare male and female adolescents on Study Habits and Academic Achievement. 10. To compare rural and urban adolescents on Study Habits and Academic Achievement. 11. To compare rural male and rural female adolescents on Study Habits and Academic Achievement. 12. To compare urban male and urban female adolescents on Study Habits and Academic Achievement. 13. To compare rural male and urban male adolescents on Study Habits and Academic Achievement. 14. To compare rural female and urban female adolescents on Study Habits and Academic Achievement. 1. Male and female adolescents differ significantly on Self-Concept and Learning Styles. 2. Rural and urban adolescents differ significantly on Self-Concept and Learning Styles. 3. Rural male and rural female adolescents differ significantly on Self-Concept and Learning Styles. 4. Urban male and urban female adolescents differ significantly on Self-Concept and Learning Styles. 5. Rural male and urban male adolescents differ significantly on Self-Concept and Learning Styles. 6. Rural female and urban female adolescents differ significantly on Self-Concept and Learning Styles. 7. Male and female adolescents differ significantly on Study Habits and Academic Achievement. 8. Rural and urban adolescents differ significantly on Study Habits and Academic Achievement. 9. Rural male and rural female adolescents differ significantly on Study Habits and Academic Achievement. 10. Urban male and urban female adolescents differ significantly on Study Habits and Academic Achievement. 11. Rural male and urban male adolescents differ significantly on Study Habits and Academic Achievement. 12. Rural female and urban female adolescents differ significantly on Study Habits and Academic Achievement. Study habits for the present study refer to the scores gained by sample subjects on Palsane and Sharma’s Study Habit Inventory. Academic achievement for the present investigation consisted of the aggregate marks secured by the sample subjects in the previous two classes i.e. 10th and 11th classes. 500 adolescents rural 250 (125 male and 125 female) and 250 urban (125 male and 125 female) comprised the sample for the present investigation. The sample has been taken randomly from Higher Secondary Schools of two Districts i.e. District Srinagar and Baramulla of Kashmir. Self-Concept for the present study has been measured by Sagar Sharma’s Self-Concept. It consists of ideal-self and real-self. Learning Styles for the present study refer the differences in preference of the right and left hemispheres for information processing on D. Venkataraman Style of Learning and thinking Inventory. The data have been analyzed by applying mean, S.D. and t-test in order to find the mean differences of the various groups. 1. Male and female adolescents have been found significantly different on Ideal-Self dimension. The mean differences favor the female group of adolescents which clearly indicates that female adolescents have high ideal-self concept as compared to male adolescents. 2. Rural and Urban adolescents have been found significantly different on Ideal-Self dimension. The mean differences favor the Rural group of adolescents which clearly indicates that Rural adolescents have high ideal-self concept as compared to urban adolescents. 3. Rural male and rural female adolescents have not shown any significant difference on Ideal-Self dimension. This indicates that the two group’s i.e. rural male and rural female adolescents have similar attitudes, knowledge and evaluation of their achievements. 4. Urban male and urban female adolescents have been found significantly different on Ideal-Self dimension. The mean differences favor the urban female group of adolescents which clearly indicates that the urban female adolescents have high ideal-self concept as compared to urban male adolescents. 5. Rural male and urban male adolescents have been found significantly different on Ideal-Self dimension. The mean differences favor the rural male group of adolescents which clearly indicates that rural male adolescents have high ideal-self concept as compared to urban male adolescents. 6. Rural female and urban female adolescents have shown insignificant difference on Ideal-Self dimension. This indicates that the two group’s i.e. rural female and urban female adolescents have similar attitudes, knowledge and evaluation of their achievements. 7. Male and female adolescents have shown insignificant difference on Real-Self dimension of Self-Concept Inventory. This indicates that the two groups i.e. Male and Female adolescents have similar attitudes, knowledge and evaluation of their achievements. 8. Rural and Urban adolescents have been found significantly different on Real-Self dimension. The mean differences favor the Rural adolescents which clearly indicates that Rural adolescents have high real-self concept as compared to urban adolescents. 9. Rural male and rural female adolescents have shown insignificant difference on Real-Self dimension. This indicates that the two groups of adolescent’s i.e. rural male and rural female adolescents have similar attitudes, knowledge and evaluation of their achievements. 10. Urban male and urban female adolescents have been found significantly different on Real-Self dimension. The mean difference favors the urban female adolescents, which clearly indicates that urban female adolescents have high real-self concept as compared to urban male adolescents. 11. Rural male and urban male adolescents have been found significantly different on Real-Self dimension. The mean difference favors the rural male adolescents, which clearly indicates that rural male adolescents have high real-self concept as compared to urban male adolescents. 12. Rural female and urban female adolescents have been found significantly different on Real-Self dimension. The mean difference favors the urban female adolescents, which clearly indicates that urban female adolescents have high real-self concept as compared to rural female adolescents. 13. Male and female adolescents have been found significantly different on Learning Styles. The mean difference favors the male adolescents, which clearly indicates that male adolescents have high verbal, content preference, class preference, learning preferences and interests as compared to female adolescents. 14. Rural and Urban adolescents have been found significantly different on Learning Styles. The mean difference favors the Rural adolescents, which clearly indicates that Rural adolescents have high verbal, content preference, class preference, learning preferences and interests as compared to urban adolescents. 15. Rural male and rural female have been found significantly different on Learning Styles. The mean difference favors the rural male adolescents, which clearly indicates that rural male adolescents have high verbal, content preference, class preference, learning preferences and interests as compared to rural female adolescents. 16. Urban male and urban female adolescents have shown insignificant difference on Learning Styles. This indicates that the two group’s i.e. urban male and urban female adolescents have similar verbal, content preference, class preference, learning preferences and interests. 17. Rural male and urban male adolescents have shown insignificant difference on Learning Styles. This indicates that the two group’s i.e. rural male and urban male adolescents have similar verbal, content preference, class preference, learning preferences and interests. 18. Rural female and urban female adolescents have been found significantly different on Learning Styles. The mean difference favors the rural female adolescents, which clearly indicates that rural female adolescents have high verbal, content preference, class preference, learning preferences and interests as compared to urban female adolescents. 19. Male and female adolescents have been found significantly different on Study Habits. The mean difference favors the female adolescents, which clearly indicates that female adolescents have better budgeting time, physical conditions, reading ability, note taking, learning motivation, memory, taking examination and health as compared to male adolescents. 20. Rural and Urban adolescents have been found significantly different on Study Habits. The mean difference favors the urban adolescents, which clearly indicates that urban adolescents have better budgeting time, physical conditions, reading ability, note taking, learning motivation, memory, taking examination and health as compared to rural adolescents. 21. Rural male and rural female have been found significantly different on Study Habits. The mean difference favors the rural female adolescents, which clearly indicates that rural female adolescents have high budgeting time, physical conditions, reading ability, note taking, learning motivation, memory, taking examination and health as compared to rural male adolescents. 22. Urban male and urban female adolescents have been found significantly different on Study Habits. The mean difference favors the urban female adolescents, which clearly indicates that urban female adolescents have high budgeting time, physical conditions, reading ability, note taking, learning motivation, memory, taking examination and health as compared to urban male adolescents. 23. Rural male and urban male adolescents have been found significantly different on Study Habits. The mean difference favors the urban male adolescents, which clearly indicates that urban male adolescents have high budgeting time, physical conditions, reading ability, note taking, learning motivation, memory, taking examination and health as compared to rural male adolescents. 24. Rural female and urban female adolescents have been found significantly different on Study Habits. The mean difference favors the urban female adolescents, which clearly indicates that urban female adolescents have better budgeting time, physical conditions, reading ability, note taking, learning motivation, memory, taking examination and health as compared to rural female adolescents. 25. Male and female adolescents have been found significantly different on Academic Achievement. The mean difference favors the male adolescents which clearly indicate that male adolescents have high Academic Achievement as compared to female adolescents. 26. Rural and Urban adolescents have been found significantly different on Academic Achievement. The mean difference favors the urban adolescents, which clearly indicates that urban adolescents have high Academic Achievement as compared to rural adolescents. 27. Rural male and rural female have been found significantly different on Academic Achievement. The mean difference favors rural male adolescents which clearly indicate that rural male adolescents have high Academic Achievement as compared to rural female adolescents. 29. Rural male and urban male adolescents have been found significantly different on Academic Achievement. The mean difference favors the urban male adolescents which clearly indicate that urban male adolescents have high Academic Achievement compared to rural male adolescents. 30. Rural female and urban female adolescents have been found significantly different on Academic Achievement. The mean difference favors the urban female adolescents, which clearly indicate that urban female adolescents have high Academic Achievement as compared to rural female adolescents. The latest concept about the influences exerted on the child starts right from the neonatal stage. This is an established fact that outer environment plays a dominant role in the formation of the body and the make-up of neonate’s mind. However, at later stage a person, to some extent, shapes the pattern of his life by the choices and decisions he makes at successive stages of life. The choice and decisions taken are usually based on the inputs that he/she has received during the preceding years, be it from family, peers or school. So far as the school influence is concerned a teacher assumes pivotal position. A teacher’s main concern in the classroom is all-round development of the child. It is a time tested adage as is the teacher so is the taught and as is the taught so is the society. A teacher dedicated in educating a child in a balanced and integrated manner has to understand the characteristics, proclivity of a child at various stages of life. Therefore, it is essential for a teacher to study the growth and development of different stages of life. Growth refers to quantitative changes in physical development, i.e. increase in size, height and weight. Growth refers to the structural and physiological changes, i.e. growth in height and weight or it may be change in the particular aspects of the body or some part of the body. The term development refers to change in structure, form or shape and improvement in functioning. When qualitative changes occur in behavioral characteristics of the child, it is called development. Development means the whole sequence of life from conception to death. It may imply the change in the organism as a whole. Hurlock says that it is “progressive series of changes in an orderly coherent pattern”. The changes are directional leading to vertical and horizontal mobility and resulting in new characteristics and new abilities on the part of the individual. Development is comprehensive which includes physical, social, and emotional and many more aspects of an individual. With the onset of adolescence, physiological changes accelerate, sexual maturity arrives, social relationships become more intense and new cognitive capacities emerge. Although psychological maturity does not occur so rapidly because teenage is a stage of transition accelerated by development. When we speak of the adolescent as “growing up,” we mean that the youth has left behind the phase of protective childhood and is becoming independent, capable of going out to fend for him/her. Early adolescence extends roughly from 13-16 and late adolescence covers the period from 16 until 18, the age of legal maturity. Adolescent is the most crucial period in the life of a human being. It is the stage when the surge of life reaches to its highest peak. The adolescent’s life is, or might be, full of hopes. The adolescents are eager to interact with new experiences, to find new relationships, to examine resources of inner strength and fathom the strength of their inner abilities. The adolescent tries to have freedom to think and set his own goals and discover means to achieve them. Adolescence is considered as a transitional phase, a “status passage” between childhood and adulthood (Fend, 2000; Flammer and Alsaker, 2002; Hurrelmann, Rosewitz and Wolf, 1994; Maggs, Schulenberg and Hurrelmann, 1997). In this transition phase, bodily, emotional, and social changes occur and these changes fully occupy the attention of the adolescents. The main questions that are stated to the self are concentrated on emotions (“How am I?”), social development (“What am I able to do?”), and identity (“Who am I?”). The adolescent way of thinking is rather egocentric (Elkind, 1978) and adolescents are quite concerned about their appearance, their impression on others, and their abilities. Also, they tend to feel that they are the focus of attention of others. Development of Self is an important phase of this stage. It refers to the image which adolescents hold about themselves. Attitudes of right and wrong may also become part of their psychological self. Self may involve, after certain stages of psychological growth, concepts like I, we, mine and yours. The growing adolescent’s ability and the concept of self, is influenced by the way in which they accept others. Closely associated with the problem of self is the quest for meaning and purpose which constantly occupies adolescent’s thinking. This is so because they are constantly in search of selfhood. Early in the History of Psychology, Self was considered as an important topic of interest. For example, in the times of James (1890), the self played a central role in psychological thinking and to a good extent; its study was pursued by introspection (Calvin, 1915). Self-concept is hence self-percepts, which have acquired meaning and which have been related to the other self-percepts. The self-percepts are observed facts, the impressions of raw material of self which individual receives via several senses. Since the person cannot subscribe the meaning to himself in a vacuum, the concept of self is generally a picture of the self; in some role a certain situation, in some position, performing a certain set of functions, or in some relationship. The whole idea of concept and percepts has been beautifully knitted by Roger in his publication. To quote him, “the self-concept or self-structure may be thought of as an organized configuration of perception of the self which are admissible to awareness. It is composed of such elements as the perceptions of one’s characteristics and abilities, the percepts and the concept of the other self in relation to the other and to the environment, the value-qualities which are perceived as associated with experiences and objects and the goals and ideas which are perceived as having positive or negative valence”. Self-concept is the way people think about themselves. It is unique, dynamic, and always evolving. This mental image of oneself influences a person’s identity, self-esteem, body image. As a global understanding of oneself, self-concept shapes and defines who we are, the decisions we make, and the relationships we form. Self-concept is perhaps the basis for all motivated behaviour (Franken, 1994). Three basic components of self-concept are the ideal self, the public self, and the real self. Cooley (1902) developed the concept of the “Looking-glass-self”. He defines it “as we see our face, figure and dress in the glass and are interested in them because they are ours and pleased or otherwise with them”. As in imagination we perceive in others mind, some thought of our appearance, manners, aims, deeds, character, friends and so on and we are variously affected by it”. According to Rogers, an accurate and positive self-concept is necessary for full functioning (Meador and Rogers, 1974; Rogers, (1983) Damon and Hart (1982) have proposed that an important distinction (first made by William James) is necessary for understanding self-concept. The distinction is between “I” and “Me.” Damon and Hart (1982) have proposed that the “Me” includes four aspects of the self: the physical self , the active self, the social self and the psychological self. Although all aspects of the self are important, the emphasis among them changes during development. Behaviour is consistent with self-concept, experiences that are inconsistent with the self-concept and are viewed as threatening, the self-concept changes as a result of learning. Learning is one of the fundamental areas in psychology. The theorists named already Pavlov, Toleman, Watson, and Skinner are some of the most influential in this discipline. The history of learning theory is, in many ways, the history of psychology. Some of the earliest psychological research came from studies in animal learning conducted by Edward Lee Thorndike in the 1890’s Edwin R. Gurthrie in the early 1900’s and from Toleman, Pavlov, and others. One of the most important movements in psychology, Behaviourism, was largely a learning-based approach. Watson founded this school of thought, and described it in his book Behaviourism (1925), in an effort to make psychology an objective and scientific field of research. He believed that all behaviour could be explained by learning principles. Skinner extended and continued this field of thought beginning in the 1930’s and behaviourism dominated psychology for the next few decades. We can categorize an individual’s strength and weaknesses about the processes of learning from a number of different factors which affect the way we learn. It is possible to refer to someone as a “visual learner” or a person who prefers “step-by-step” directions. By assessing and then planning for each student’s individual learning style, a teacher can improve the chances of each student to learn. Another element of diversity in the classroom may be the learning style. Learning styles appear to be biological and perhaps socialized differences that influence class-room learning, in particular and lifelong learning in general. They reflect qualitative differences or preferences and do not reflect how young students are or how well the students are developed cognitively. How the student feels about himself/herself and how self-esteem is developed are also linked to learning. There are consistent ways to facilitate learning through the use of the senses or environmental stimuli, hemisphere specialization (i.e. right or left brain) auditory, visual. Kinesthetic olfactory preferences or preferences for environmental conditions e.g. light, noise are examples of physiological styles. There are consistent ways of responding and using stimuli in the environment, how things are perceived and made sense of, the most comfortable, expedient and pleasurable way to process information e.g. student may utilize field dependent or independent impulsive or reflective cognitive styles. The more students grow, the more sophisticated they become, but each has preferred styles or ways of learning. A Student’s preferred style of learning influences his/her achievement. A great variety of learning styles have been identified. Many are applicable to special education (Dunn, 1983), while others are more appropriately applied to higher education (Gregoric, 1979). Different theorists have taken different theoretical and applied approaches to the study of learning styles. Ausburn and Ausburn (1978) have emphasized the study of learning styles as cognitive styles, and vice versa. Gregoric (1979) has conceptualized learning styles on the basis of student’s preferences for particular learning sources and whether students prefer to learn through concrete or abstract means. He thus has been able to distinguish among abstract-sequential, abstract-random, and concrete-random learners. Hunt (1974) has proposed a conceptual level (CL) learning style model embodying dimensions of cognitive complexity, maturity, independence, and adaptability to social environments. Dunn and Dunn, whose work has been particularly school and classroom oriented (1975, 1977, and 1979), have identified four major categories of learning-style variables: (1) environmental, (2) emotional, (3) sociological, and (4) physical. Dunn’s environmental category involves learning style elements relating to student’s preferences for learning under different conditions of light, sound, temperature, and design (the last involving preferences for studying under formal or less structured learning conditions). Dunn’s emotional category concerns a student’s motivation, persistence, responsibility, and the need for structure. Their sociological category relates to student’s preferences so as to learn by himself/herself or with others. The physical needs category involves modality preferences in learning, which Dunn and Dunn stress heavily, and other physical needs variables they believe are important to learning. In the process of learning, a learner’s habitual ways of exercising and practicing their abilities for learning are considered as study habits of learners. The pattern of behavior adopted by students in the pursuit of their studies is considered under the caption of their ‘study habits’. Learner’s learning character is characterized by his study habits. Habits are true indicators of individuality in a person so study habits are the behavior of an individual related to studies which is adjudged from his study habits. Study habits serve as a vehicle of learning. It may be seen as both means and ends of learning. Study habits play a very pivotal role in the life of students. The Success or failure of each student depends upon his/her own study habits. Of course, study is an art and as such it requires practice. Some students study more but they fail to achieve more. Others study less but achieve more. Success of each student definitely depends upon ability, intelligence and the effort of students. No doubt, regular study habits bring their own reward in the sense of the achievement of success. Study habits refer to the activities carried out by learners during the learning process of improving learning. Study habits are intended to elicit and guide one’s cognitive processes during learning. According to Patel (1976) study habits include. (1) Home environment and planning of work (2) Reading and note taking habits (3) Planning of subjects (4) Habits of concentration (5) Preparation for examination (6) General habits and attitudes (7) School environment. Study habits are influenced by teaching methods adopted and the material they are to learn. So, it is the effort of teachers to develop good study habits among students. Such habits are the best equipments with which they can live and lead their lives with confidence. If the habits are developed at a young age, they will definitely cherish the joy of its fruits in the rest of their lives, because grown up children are already habituated to certain things. So they find it difficult to modify their habits and behavior. Therefore, it is better to develop study habits in the initial stage of life. It is the proper time and age to cultivate study habits. Many students do not study just for the sake of studying. Study is hard work. A great number of motivational interest; work habits and personality characteristics combine in various ways to determine school achievement. Many studies have shown that among the many variables that affect academic achievement, motivation is obviously an important one. Whether a student will work at a task to pursue excellence at any given time during the day depend on his consummators needs (hunger, thirst etc) being met; his hierarchical structure of internal motives to achieve success in various activities and his tendencies to avoid failure. Grades are the most universally accepted indicators of achievement in educational settings that focus on the student (Anaya, 1999; Biggs, 1989; Goberna 1987; Harackiewicz, Barron, and Elliot, 1998; Pardo and Olea, 1993). Academic achievement occupies a very important place in education as well as in the studying and learning process. Good (1973), has defined, academic achievement as knowledge attitude or skills developed in the school subject usually designed by test scores or by marks assigned by a teacher or by both. Consequently, academic achievement could be defined as self perception and self evaluation of one’s objective success. Academic achievement is defined by Crow and Crow (1969) as the extent to which a learner is profiting from instructions in a given area of learning i.e., achievement is reflected by the extent to which skill and knowledge has been imparted to him. Academic achievement also denotes the knowledge attained and skill developed in the school subject, usually designated by test scores. Academic achievement is considered as a key criterion to judge one’s total potentialities and capabilities. Therefore, it is more pressing for the individuals/students to have high academic achievement. The term ‘achievement’ refers to the degree or the level of success attainted in some specific school tasks especially scholastic performance. In this sense, academic achievement means the attained ability to perform school tasks, which can be general or specific to a given subject matter. Academic achievement could be defined as self-perception and self-evaluation of one’s objective academic success. Academic achievement generally indicates the learning outcomes of a pupil. Achievement of those learning outcomes requires a series of planned and organized experiences. Self-concept plays a vital role and has significant bearing on the existence and life of an individual. If a person understands and realizes himself in a right way, he develops positive self-concept and he turns into a star. If he does not understand himself in a right way, he develops negative self-concept and turns into waste. A student who is abused, insulted, beaten etc develops a negative self-concept and therefore remains academically backward where as a student who is reinforced positively becomes a high academic achiever. We know that a student’s memory, reasoning, problem solving, thinking, understanding, recall, recognition, perception, attention and memorization etc all are influenced by his self-concept; therefore, self-concept should be developed in a right way, so that these abilities would achieve maximum heights on the academic side. Self-concept is important to provide the required motivation in order to be academically successful (Branden, 1994; Cigman, 2004; Ferkany, 2008; Lawrence, 2006; van Laar, 2000), and facilitating the student’s self-concept might be a part that supports the school’s academic goals, without making it as an educational priority (Ferkany, 2008). On the other side, self-concept can be seen as a construct that mediates between ability and achievement; self-concept could influence subsequent achievement, and achievement could influence subsequent levels of self-concept (Humphrey, 2004; Mruk, 2006). Thereby children with low self-concept are less successful (Mann, Hosman, Schaalma, and De Vries, 2004). In other words, student’s self-concept is an important attribute concerned with the academic achievements. Students with positive self-concept would likely to be motivated to strive for higher academic achievements, and in turn, higher academic achievement is likely to boost their self-concept. Self-concept is an important concept of any adolescent’s development. For people of all ages, the development of full human potential is enhanced through a high self-concept. High self-concept can begin to develop when the acceptance of all individuals and their personal and group contributions are recognized and applauded, (Redenback, 1991). Self-concept construct is recognized today to be a major factor in learning outcomes (Lawrence, 2000). Research has documented the important role that high self-concept plays in academic achievement, (Redenbach, 1991). As adolescents develop a sense of self and interact with and gain experience in the world, their self-concept is affected. The importance of self-concept within educational settings has been discussed by several scholars and has led to the performance of studies, examining the role of self-concept in school performance (Olivia, 1999). Baumrind (1991) suggested that the development of self-concept of adolescents requires an environment that provides the freedom to explore and experiment. Individuals with high self-concept tend to have confidence in their own abilities, to make decisions, expectations for successful outcomes, and relationships that are characterized by respect and dignity (Tuttle and Tuttle, 2004). Therefore, the manner in which these are involved in the development of self-concept is an important area of research. Some adolescents have negative self-images; they may view themselves as failures, having negative thoughts about themselves, depending on their parents and others, and may have difficulties with social skills (Vernon, 1993). To develop a healthy self-concept, they need to be provided with interventions, such as counseling, stress-reduction techniques that help them in developing their personal and social skills. The most significant issue in learning is to learn and taking the responsibility for his/her own learning. The individuals should know what their own learning styles are and what characteristics this style has and they should thereby, behave according to that style. In this way, the individual can acquire the constantly changing and increasing amount of information without need for the assistance of others. When the learner takes the responsibility of his/her own learning, he/she attributes meaning to the process of learning. She develops an understanding of his/her own form of learning style and becomes much more satisfied with the environment he/she interacts with. Every opportunity for learning is a chance for him/her. It is in the learner’s hand to use different ways and develop the learning styles to some extent (Coffield, 2004). Learning style is important for many reasons; however, there are three vital ones. First of all, people’s learning styles will vary because everyone is different from other naturally. Secondly, it offers the opportunity to teach by using a wide range of pedagogies in an effective way. Sticking to just one model unthinkingly will create a monotonous learning environment, so not everyone will enjoy the lesson. In other words, learning and teaching will be just words and not rooted in reality. Thirdly, we can manage many things in education and communication if we really recognize the groups under consideration. Of course, we may not know every detail; however, being aware of our students’ learning styles, psychological qualities and motivational differences will help us regulate our lessons appropriately and according to the conditions (Mc Carthy, 1982; Felder, Silverman, 1988; Coffield et al., 2004). Learning style thus occupies an vital place in the lives of individuals. When the individual knows his/her learning style, she will integrate it in the process of learning and she will learn more easily and quickly and will be successful. Another advantage of the identification of his/her own learning style by the student, is that it will help the student to become an effective problem solver. The more successful the individual is at solving the problems he/she faces, the more control he/she will take over his/her own life (Biggs, 2001). It is important that individuals receive education in areas suitable for their learning styles. A person educated in an area having no relationship to his/her learning style may lack confidence and he/she may be less successful; he/she may as a result become frustrated. The pressing demand from the students of modern times is that if I do not understand the way you teach why you don’t teach me the way I understand. Knowledge of learning style also provides information to the student as to why he/she has learnt in a different way from others. It helps to control the process of learning. It is vital because one of the most important signals in learning is to learn to be autonomous, that is, for the individual to take responsibility for his/her own learning. Because of this, he/she should know what learning style is. This has to be part of the learning process; to enable the individual to obtain knowledge, which constantly shifts and changes, without any help from others. Briefly, confidence in learning will consistently rise when learners know how to learn. Learning style theory provides information on how individuals process information and prefer to learn (Garity, 1985). Learning styles are the way individuals concentrate on, absorb, and retain new or different information or skills (Braio, 1987). The quest for understanding learning styles of a population is not new. Research that addresses the learning styles of many populations, health professionals included (Highfleld, 1988), has existed for many years. Some of the original learning style research had its beginnings in the 1970s (Canfield, 1976; Dunn, Dunn, Price, 1979; Kolb, 1976; Renzulli Smith, 1978). Several of these learning style inventories that resulted from early research have been revised and updated (Kolb, 1985; Price, 1996; Renzulli, Smith, Rizza, 1998). Information about student learning styles provides a great deal of knowledge about how styles can assist educators in maximizing students' potential for success and assist the student in developing additional learning strengths. Learning to learn and grasping knowledge in a suitable manner will lessen the need for an overbearing control by teachers, because at that period of time teachers guide the students. The students take responsibility for their learning, they are at the centre of the process and everything is under their control. They search answers to the problems and benefit from their unique performances and preferences in their learning styles. Those people will identify their aims, unlike those whose learning style preferences are not identified. They know what they want to learn and “how.” This awareness will change their perspectives on learning new things (Fidan, 1986). The task of learning, it may be noted here, is not dependent on the teacher alone. It is not only the responsibility of teachers, but is also the responsibility of pupils. Efficient learning depends not on good teaching alone but on satisfactory learning procedures also. Efficient learning depends upon the learner’s ability to schedule his time, the plan of his study, the habit of concentration, note taking, mental review, over learning the judicious application of whole and part method, massed and distributed learning and so on. In other words, learning involves the development of proper study habits, and skills. The problem of study habits is one of immense importance, both from the theoretical as well as practical point of view. Learning styles has been the focus of attention and is useful in improving learning information about style. It can also serve as a great assistance in designing learning experiences that match or mismatch a student’s style. Knowledge of learning style scans by helping teachers to design experiences that are appropriate for students in terms of matching and mismatching and enables them to do so thoughtfully and systematically. Information about learning style is extremely helpful in student affairs. In counseling e.g. style may suggest which approaches to counseling are to be used for particular students; further when students have problems in courses it can guide the counselors effort at intervention in orientation; It can help students understand their own preferences and strengths in learning and to be a stimulus for developing in new ways of learning. The style of learning and thinking are as important as levels of ability and we often ignore the identification of the thinking styles at their earlier and appropriate stage. It is foremost important for the teachers to focus their attention on a student’s favorite thinking styles before imparting the subject matter. If they fail to do so, the consequences may be serious, because the teachers may tend to confuse styles of the student’s mind. Since the method of teaching adopted by teachers often reflects their personal thinking style, the students who have the same thinking style of the teachers are only benefited and rewarded. Since any subject can be taught in any way that is compatible with any style, students will seek learning activities that are compatible with their own preferred styles, both teachers and students tend to exploit their preferred styles, which may or may not match. Therefore, it is important for the teachers to know the students preferred styles, so that the teachers can capitalize the opportunities for students learning. Styles like abilities are not formed by birth. They are partly developed due to environmental condition by way of nurturing children by their parents and teachers. Some individuals may have one preferred style at one stage and other preferred styles at another stage. Styles are not fixed, but changeable. We need to recognize the preferred styles of students and ourselves. The efforts to understand learning and thinking styles and to learn to use them flexibly require the identification of an individual’s preferred style of learning and thinking. Teachers must eventually come forward to understand and identify the styles of learning and thinking in students. This direct approach will help to understand and assess the styles of students for developing intelligence and creativity in the fields of their preferred styles in academic areas. Thus the ‘Tool’ is very important to assess the preferred styles of students learning and thinking. Learning style also plays a role in classroom performance for school students as was reported by Rayneri and Gerber (2004). Students respond accordingly to different classroom environments. They have a high preference for tactile and kinesthetic learning style and like to be active participants in the discovery process in order to be motivated and engaged in class. Mismatch in the students’ learning style preference with learning environment would result in academic underachievement (Redding, 1990: Whitmore, 1986). Insight into student’s learning styles may provide useful instructional and hints for teachers. The efficient and effective way of learning depends upon the study habits of the students. Study habits are important and they influence the academic achievement of students. So parents and teachers must help in improving the study habits of students. Some investigators have sought to determine what study habits are characteristically used by pupils when left to work by themselves with little or no direction. Teachers in schools should become facilitators of learning. The finite treasure within every learner should be discovered and nurtured for the purpose of improving learning effective study skills have to be taught. Study skills involve reference, reading listening, study habits and strategies. Learning improves with planning of where, when and how much to study. Positive attitude, proper physical condition and balanced emotional states are important factors influencing study habits (Crow and Crow, 1956). With many habits the sooner adolescents start practicing and developing good study habits, the better chance they have and will continue with them. Good study habits are important part of any student’s success. One can probably diminish the academic dishonesty by promoting good study habits with students and letting them know that good study habits are very important when it comes to school, still even procrastination can be overcome with proper study habits by improving the students study habits. Good study habits are a great tool to have the tool box of life. A good way to stay organized is to use folders so that the child can keep his/her assignments until needed and it is great way of staying organized. Once children reach the grades where home work and tests are part of the curriculum, there are many things parents can do to encourage good study habits. An effective way to study is to study before and while child can do the homework. A little amount of home work may help students build study habits. Assigning and having home work routines are the most important things that help a child to develop good study habits for life. All learning, however, is a process which settles into certain steps. Students with learning problems, however, may still have generally inefficient study habits and skills. Becoming aware of students learning style will help a teacher to understand why students sometimes get frustrated with common study methods. Proper study habits in an individual are of most significant importance. It helps an individual to attain mental peace and enables him to interact in an impressive manner. It is quite natural that every individual is a slave of habits whether good or bad but it is wise to have good study habits as they benefit the students. Instead of wasting time and leisure it is better to utilize every second in obtaining and acquiring knowledge and thus includes good study habits. Study Habits is an important aspect in the field of educational psychology and is ultimately related to learning and achievement. Majority of the students face a serious problem of how to study and lack of awareness is a hindrance to become good academic performers. It is the absence of proper study habits and techniques that they fail to achieve the maximum within the limited time schedule. Like any other habit, study habits are also acquired through learning. Students get habituated to read and write in certain fixed ways. Effective study habits are a very important part of the learning process. Good study habits are all about keeping to a daily routine and giving all subjects equal treatment. Hard work and good study habits are assets that should be nurtured. Learning and study habits are obviously crucial as well. Good study habits are important for all students to make the best use of investment of time and money to achieve educational goal. After this students study habits are permanently altered and will help students in their own preparation as you start teaching and last a life time. The main priorities are class attendance, time management and great study habits all of which are necessary for academic success. Study habits help students master their areas of specialization. Study habits have direct bearing on the learning good habits, having a positive effective while as the poor study habits hamper even the normal course of learning. The teacher should know as much as possible about the pupils work and study habits. He can observe certain habits during the schools hours, interview, his parents and teacher will provide additional information. If the teacher knows the pupils interests, he can use them as the initial main-spring of action that may help in developing good study habits among the pupils. Most of the educational crises such as underachievement, absenteeism, stagnation, and academic drop outs are usually concerned with the improper utilization of the study programs with respect to study time (Raj and Sreethi, 2000). Poor habits of study not only retard school progress but develop frustration, destroy initiative and have different level of academic achievement i.e. high and low. Academic achievement of the students is determined by their study habits and learning styles. Study habits, learning styles and academic achievement are very essential for research workers and educationists to know that every child whether he is gifted, slow learner, under achiever etc should be educated in their own way but if they possess good study habits they can have better learning styles and perform better in every situation and if children do not possess good study habits and learning styles they cannot perform well in life. It is the study habits and styles of learning which help the learner in obtaining meaningful and desirable knowledge as good study habits and learning styles act as a strong weapon for the students to excel in life by achieving excellence in their respective fields of education. The importance of scholastic and academic achievement has raised important questions for educational researchers. What factors promote achievement in students? How far do the different factors contribute towards academic achievement? (Ramaswamy, 1990) The desire of success is derived from an individual’s concept of himself and in terms of the meaning of various incentives as they spell success and failure in the eyes of others. Thus a child, who sees himself as top ranking, or as a scholar, may set his goal and the attainment of the highest grade in the class. A modern society cannot achieve its aim of economic growth, technical development and cultural advancement without harnessing the talents of its citizens. Academic achievement is a capacity to excel which is an important component for every person especially for a student to be successful, as he/she is always facing competitive situation in his educational career. Achievement after all is the end product of all educational endeavors. The main concern of all educational efforts is to see that the learners achieve. A teacher is supposed to arrange the educational situation in a way so as to encourage pupils to put their heart and soul in the school activities. Hence the problem of achievement has drawn sufficient attention of researchers in the field of educational psychology. Tiwari and Bansal (1994) mentioned that a child with high academic achievement is likely to be well-treated as well as behaved and independent and slow learners, under achievers as incapable and deprived of employment, which may lead to maladjustment in life. Balasubramaniyam (1992) while reviewing studies on correlates of achievement has observed, “Achievement is the end product of all educational endeavors. The main concern of all educational efforts is to see that the learner achieves. Quality control, quality assurance and of late total quantity quality management of the achievement have increasingly gained the attention of researchers in education”. Quality of performance has become the key factor for personal progress. Parents desire that their children climb the ladder of performance to highest level as much as possible. This desire for a high level of achievement puts a lot of pressure on students, teachers, and schools in general including the education system itself. In fact, it appears as if the whole system of education revolves round the academic achievement of students, though various other outcomes are also expected from the system. Thus a lot of time and effort of the schools are used for helping students to achieve better in their scholastic endeavors. Anwana and Cobbach (1989) are of the view that students do badly academically on account of factors other than low intellectual capacity. 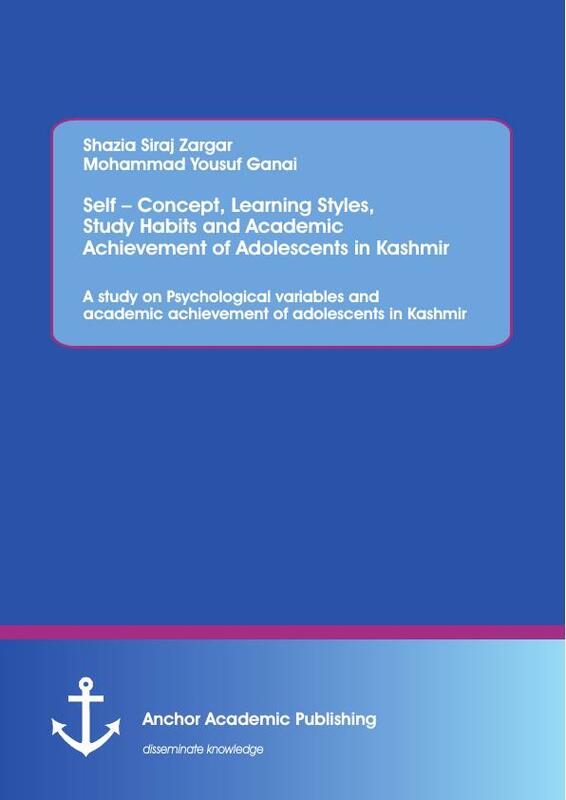 The purpose of the present investigation was to examine the differences in the self-concept, Learning Styles, Study Habits and Academic Achievement of adolescents in Kashmir. The study will become a guideline for researchers, administrators and counselors in order to guide the students in a proper way so that they may develop good Self-Concept, Study Habits, Learning Styles and Academic Achievement. 15. To assess Self-Concept and Learning Styles of adolescents. 16. To assess Study Habits and Academic Achievement of adolescents. 17. To compare male and female adolescents on Self-Concept and Learning Styles. 18. To compare rural and urban adolescents on Self-Concept and Learning Styles. 19. To compare rural male and rural female adolescents on Self-Concept and Learning Styles. 20. To compare urban male and urban female adolescents on Self-Concept and Learning Styles. 21. To compare rural male and urban male adolescents on Self-Concept and Learning Styles. 22. To compare rural female and urban female adolescents on Self-Concept and Learning Styles. 23. To compare male and female adolescents on Study Habits and Academic Achievement. 24. To compare rural and urban adolescents on Study Habits and Academic Achievement. 25. To compare rural male and rural female adolescents on Study Habits and Academic Achievement. 26. To compare urban male and urban female adolescents on Study Habits and Academic Achievement. 27. To compare rural male and urban male adolescents on Study Habits and Academic Achievement. 28. To compare rural female and urban female adolescents on Study Habits and Academic Achievement. 13. Male and female adolescents differ significantly on Self-Concept and Learning Styles. 14. Rural and urban adolescents differ significantly on Self-Concept and Learning Styles. 15. Rural male and rural female adolescents differ significantly on Self-Concept and Learning Styles. 16. Urban male and urban female adolescents differ significantly on Self-Concept and Learning Styles. 17. Rural male and urban male adolescents differ significantly on Self-Concept and Learning Styles. 18. Rural female and urban female adolescents differ on Self-Concept and Learning Styles. 19. Male and female adolescents differ significantly on Study Habits and Academic Achievement. 20. Rural and urban adolescents differ significantly on Study Habits and Academic Achievement. 21. Rural male and rural female adolescents differ significantly on Study Habits and Academic Achievement. 22. Urban male and urban female adolescents differ significantly on Study Habits and Academic Achievement. 23. Rural male and urban male adolescents differ significantly on Study Habits and Academic Achievement. 24. Rural female and urban female adolescents differ significantly on Study Habits and Academic Achievement. Self refers to the image which adolescents hold about them. It is composed of many psychological states like feeling, attitudes, impressions, habits, dispositions, likes and dislikes (Kundoo and Tutoo 2000). Purkey (1988) defined Self-concept as “the totality of a complex, organized, and dynamic system of learned beliefs, attitudes and opinions that each person holds to be true about his or her personal existence” He perceives self-concept as expressions of self worth which describes the degree of gratification of own oneself. Huitt (1998) defined self-concept as the general perception an individual has about him/herself. Self-concept is defined as the value that an individual places on his or her own characteristics, qualities, abilities, and actions (Woolfolk, 2001). Learning Style includes both the way person masters content and skills and the way a person adapts to reality (Highfleld, 1988). Gregorc and Butler (1984), learning styles are the "natural qualities of an individual's mind, manifested in four basic learning channels ... through which distinctive behavior, characteristics and mannerisms" are exhibited. Dunn, Dunn, and Price (1986) have interpreted learning style to mean more than a cognitive processing of information, in that learning style is more comprehensive and inclusive. Learning style is an individual preferred or habitual ways of processing and transforming knowledge (Kolb 1984 and Honey and Mumford 1992). Learning styles is the cognitive, affective, and psychological traits that serve as relatively stable indicators of how learners perceive, interact with, and respond to the learning environment (Keefe 1987). Dunn and Dunn (1986) hold that each individual’s concentration on, mental processes, internalization and retain of new and difficult information stem from his specific learning style. Learning Styles for the present study refers to the scores obtained by sample subjects on D. Venkataraman’s Style of Learning and thinking Inventory. Academic achievement for the present investigation comprises the aggregate marks secured by the sample subjects in the previous two classes i.e. 10th and 11th classes. A Literature review is a description of the literature relevant to a particular field or topic. It gives an overview of what has been done, who the key writers are, what are the prevailing theories and hypotheses, what questions are being asked and what methods and methodologies are appropriate and useful. As such it is not itself primary research, but it reports on other findings. A literature review is a body of test that aims to review the critical points of current knowledge or methodological approaches on a particular topic. Literature reviews are secondary sources, and as such, do not report any new or original experimental work. Most often associated with academic-oriented literature, such as thesis, a literature review usually precedes a research proposal and result section. Its ultimate goal is to bring the reader up to date with current literature on a topic and forms the basis for another goal, such as future research that may be needed in the area. A well-structured literature review is characterized by a logical flow of ideas; current and relevant references with consistent, appropriate referencing style; proper use of terminology; and an unbiased and comprehensive view of the previous research on topic. A literature review is both a summary and explanation of the complete and current state of knowledge on a limited topic as found in academic books and journals. It gives readers easy access to research on a particular topic by selecting high quality articles or studies that are relevant, meaningful, important, valid and summarizing them into one complete report. It provides an excellent starting point for researchers beginning to do research in a new area by forcing them to summarize, evaluate and compare original research in that specific area. It ensures that researchers do not duplicate work that has already been done. It can provide clues as to where to focus. It highlights key findings. It identifies in consistencies, gaps and contradictions in the literature. It provides a constructive analysis of the methodologies and approaches of other researchers. The accumulated research in all the disciplines for the last two decades has been accomplished a host of sub-areas with the result that the present day researchers seems to be altogether different from the studies, which were conducted in the past. Therefore, review of the previous literature for the development of objectively based hypotheses and enunciation of the new research design has become essential. The review of the educational literature gives educator an excellent overview of the work that has been done in the fields and helps him in keeping up with recent development. Review of the related literature besides to allow the researcher to acquaint himself with current knowledge in the field or area in which he is going to conduct his research. For a worthwhile research, the researcher needs to acquire up to date information relating the problem, which is done through the review of the related literature. The survey of the related literature enables the investigator to locate the gaps and find the trends in the research tools employed by the other investigators helps the future investigators to state the problem; to weigh its significance, to work out data gathering devices suggest research design, to identify sources of data, to make effective statistical analysis, to arrive at potent conclusions and avoid duplication. Knowledge of related literature enables the investigator to define the frontier of his field. By reviewing the related literature the researcher can avoid unfruitful useless problem areas. He can select those areas in which positive findings are very likely to result and his endeavors would be likely to add to the knowledge in a meaningful way.